Fifty of our best roses have been used to make up this breath-taking bouquet! The red roses are beautifully complemented by gum leaves. The bouquet is further wrapped in hessian material and is bound by raffia string. 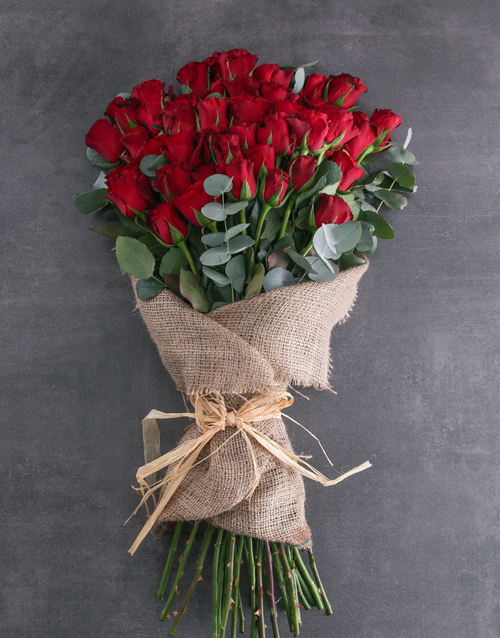 Purchase this layered 50 red rose bouquet and have NetFlorist deliver it on your behalf. Send Valentine's Day flowers today! Get this Layered 50 Red Rose Bouquet delivered with NetFlorist. "Decent price for so many roses. Came well-presented and delivery was on time. Felt like good quality for my money"
"Blown away! What an awesome gift! I can't stop looking at them"